The students are protesting against the free market system of education created by Pinochet, which has been responsible for rising costs, inequity, and poor quality of government education. Specifically, students are protesting against the introduction of a law which will increase the costs of university education, but they are also calling for a complete change in the system: they demand a change in the country’s constitution, which will change the government’s duty to provide a good free education. Some students go further, and take control of the school (called a ‘toma’), occupying it until their demands are met. 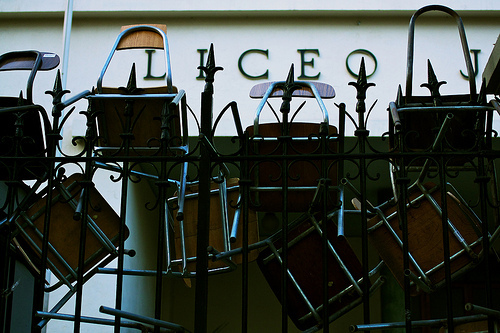 A high school ("liceo") taken over by students in Santiago, Chile. Image by Flickr user Erwin Horment (CC BY-ND 2.0). On Friday, the Mayor of Los Lagos, the headmaster, teachers, parents and friends arrived to find out that 30-60 students had taken control of the school. At 1.30 in the morning, in what must have been sub-freezing temperatures, they had jumped the fence, opened the locked doors, disabled the alarm, put up signs and chained the gates against the public. Some students are there for the adventure, some because they wanted to do something about the state of education. In my school, I didn’t see students walking around with a copy of the constitution under their arms, but neither were they drinking and breaking windows, as happened in other locations. There was a real sense of excitement and purpose in the air — as one student said, “It’s good to feel everyone so united”. Amidst calls such as “I’m scared! The Inspector is outside”, “How do you work the heating here?” and “Come quickly! The noodles are burning!”, students were making a stand for their right to a quality education. 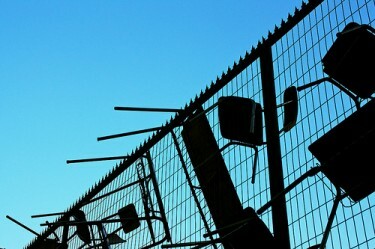 Students hang chairs and desks from the schools' gates to show they are in a "toma". Image by Flickr user Erwin Horment (CC BY-ND 2.0). Una tarde lluviosa en Santiago. Cientos de colegios y universidades paralizadas o en toma a lo largo de Chile. Adentro de ellos, se combate el frío, el hambre y la humedad con los métodos que estén al alcance de la imaginación. Más allá de la comida y el abrigo está el calor de los compañeros que se unen en la lucha por un presente y un futuro que asegure que nadie que no tenga dinero se vea excluido de educarse, por ende, de crecer y liberarse, al menos relativamente. A rainy afternoon in Santiago. Hundreds of schools and universities paralyzed or taken over by students throughout Chile. Inside, students fight the cold, hunger and humidity with whatever means they can imagine. Beyond the food and shelter there is the warmth of the classmates that have come together to fight for a present and a future that ensures that no one who does not have money is excluded from gaining an education, and therefore from growing and breaking free, at least relatively. But outsiders are not the only ones reporting what transpires inside the student-controlled schools; students inside the ‘tomas’ around the country are sharing their experiences online through videos and blogs. Like youth from the Liceo Zapallar in Curicó –in Chile's central valley, south of Santiago– who are blogging, sharing pictures and even live streaming their ‘toma’. In the blog [es], Diego Ortega explains that around 150 students took over the school peacefully on June 16. Currently, 25 to 35 students are inside the school representing their classmates, he explains. CanalFech, the YouTube channel of the University of Chile's Student Federation, has posted videos of ‘tomas’ from several schools in Santiago, like Liceo 7 de Ñuñoa, Liceo A-13 Confederación Suiza, and this video of the moment when University students took over the ‘casa central’ (headquarters) of the University of Chile. Meanwhile, on Monday, July 18, President Sebastián Piñera announced changes in his Cabinet, replacing Minister of Education Joaquin Lavín with former Justice Minister Felipe Bulnes. Whether a fresh face in the Ministry will persuade students to end their ‘tomas’ is yet to be seen, but for now, students seem immovable in their cause for high quality, free education. Wow! It is exciting to see students fight for high quality education. In my country, there is an overwhelming amount of apathy on the part of students towards education. Kudos to the students of Chile!